Mysterious Island was written by Malcolm Brockbank and appeared in the May 1999 issue of the newsletter. The prize was three silver dolphins on a polished mahogany base. The story involved the tale of captain Thomas Jacobs, and his wife Esmerelda and their only son. All three were lost to the depths of the sea in separate but equally violent storms. It was said by close friends that their souls were free to roam the seas in the form of dolphins. 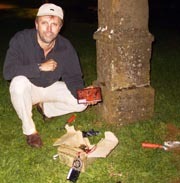 The hunt was solved in Spring 2001 by John Gibbons. John also solved the red herring in this hunt, as did John Elliott. But it was the third person to solve the herring, Martin Dennett who actually managed to find the prize an Ampthill in Spring 2000.